A US judge has sentenced a Chinese national, Xiang Li, to 12 years in prison for selling more than $100m (£62m) of pirated US software. Mr Li is accused of stealing software from 200 US manufacturers and selling it for a fraction of their prices. He was arrested in the US Pacific territory of Saipan in June 2011 and pleaded guilty earlier this year. US officials have said that this is the first time a Chinese national had been prosecuted in the US for such crimes. The firms that were targeted by Mr Li include Microsoft, Oracle, SAP and Rockwell Automation. He operated by searching for hacked software on internet forums. 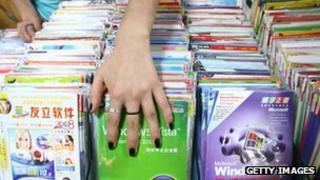 He then put it up them for sale on his websites, which offered more than 2,000 pirated titles, US prosecutors had claimed. The pirated software was said to be sold for as little as $20 to up to $1,200 - while the retail value of the products were much higher, ranging from several hundred dollars to more than one million dollars apiece, according to US officials. The pirated programmes were transferred to customers via email, and Mr Li and a second suspect collected payment through money transfer services. The scam came to light after a US manufacturer discovered his company's software was being sold on Mr Li's website and notified authorities. US authorities have said that Mr Li will be deported after he is released from prison. Last month, a report released in the US called China the world's largest source of intellectual property (IP) theft. The study, which was led by Dennis Blair, Mr Obama's former director of national intelligence, and Jon Huntsman, former US ambassador to China and Republican presidential candidate, claimed that IP theft was costing the US an estimated $300bn each year. It added that China was thought to be behind 50-80% of the theft. It recommended US authorities introduce strict measures including import or investment curbs on companies failing to protect IP rights.